Not long after Jesus’ execution, however, his disciples re-emerged in Galilee and in Jerusalem. They now made a bold claim: Jesus was indeed the Messiah and although his execution was unexpected and apparently contrary to the texts of messianic Judaism, God had “raised up” the Messiah to heaven and was soon going to send him back again, this time not as the non-violent Jesus, who had allowed himself to be martyred, but as the powerful “Christ” (the Greek word for Messiah) who would drive out the Romans and rule the whole world from his capital, Jerusalem. Soon, this group of Jesus’ followers came to be seen as a new sect within Judaism, under the leadership of James, the brother of Jesus, and with their headquarters in Jerusalem. They also referred to themselves as followers of “The Way.” Some scholars call them the “Ebionites”. They have been variously referred to by other scholars as the “Nazoreans”, the “Jerusalem Church” and as “Jewish Christians”. The sect thrived from the late thirties of the First Century until the crucial year 70. It would be completely anachronistic to refer to this “Jesus Movement” as Christianity, because all its members were practicing Jews, observing the Sabbath, attending synagogue services, visiting the Temple on the Jewish holy days and observing the dietary strictures prescribed in the Torah. The only thing that differentiated them from their fellow- Jews of the mainstream and of other sects was their belief that the Messiah had already appeared once in order to be martyred, and was now about to stage his “Second Coming.” They gladly propagated their faith, welcoming non-Jews into their fold. They made it clear to these newcomers that they were essentially being converted to Judaism and that they had to undergo circumcision, observe all the Jewish practices mandated by the Torah as revealed to Moses, and believe that the crucified Messiah, Jesus, was soon to return. It should be noted that they did not view Jesus the Messiah as God incarnate. All the Jewish scriptures pertaining to the coming of the Messiah saw him as no more than a unique human being commissioned by God to restore Israel to greatness and to rule the world on God’s behalf. The concept of God becoming incarnate in human form has always been completely alien to Judaism. Jews have historically viewed incarnation as a pagan belief. In fact, there is not a single verse anywhere in the Hebrew Bible (the Old Testament, to use Christian terminology) that even remotely hints that the Messiah would also be God incarnate. There were however other schools of thought in the Roman Empire with very different views on the significance of Jesus. There were, for example, several groups of “Gnostics”, who viewed Jesus as a spirit being who came to earth disguised as a human in order to reveal (to a carefully chosen group of initiates) secret knowledge (“Gnosis”) about the way to immortality. However, none of them had the far-reaching impact of a man named Saul of Tarsus, who never knew Jesus in the flesh but claimed that he had had a deep mystical experience in which Jesus revealed himself directly to him. Saul had until then been a zealous Jew of the Pharisee sect, and a militant opponent of the Jesus movement in Jerusalem. Following his conversion, he called himself Paul and allied with the very Jesus movement he had hitherto persecuted. He, however, did not stay in Jerusalem, but embarked on a series of missionary journeys, claiming to be an emissary of Jesus, and seeking converts all over the Roman Empire, primarily in the cities of Asia Minor (now Turkey), Greece and Italy. He largely avoided the Jewish communities of the Diaspora and focused instead on the gentile (non-Jewish) population. In a matter of a few years, he had succeeded in establishing “ekklesias” (originally meaning ‘assemblies’, but eventually coming to be known as ‘churches’) full of gentile converts, whom he kept instructing through a series of letters. Those of his letters that survived were eventually destined to form the earliest segment of the scriptures of Christianity, known as the New Testament. Although he kept maintaining that he remained a Jew, his letters are full of instructions to his gentile converts that they should not accept Judaism, but see themselves as believers in Jesus as their savior from sin, the one who puts them right with God and the one who assures them of eternal life after death. This soon brought him into open conflict with the Jerusalem group and it is extremely likely that he was censured by its leadership, especially by James. The Acts of the Apostles, a later Christian text, claims that there was a compromise agreed upon at the “Council of Jerusalem” under the terms of which Paul was permitted to waive most of the requirements of the Jewish observances for his gentile converts. It soon became evident to any independent observer that “Pauline” Christianity was already beginning to diverge from the ‘Jesus movement’ within Judaism. Until the year 70, these two “Jesus movements” co-existed, albeit not without friction between them. It is to the major events of that pivotal year that we must now turn in order to see why both Pauline Christianity and mainstream Judaism survived, while the Jesus-honouring Jewish sect led by James simply vanished from history. In the year 66, Jewish groups committed to armed revolt against the Roman colonial regime, chiefly the group known as the Zealots, managed to launch a surprisingly effective military campaign and took control of both Jerusalem and large areas of Galilee. Vespasian, the Roman general specially commissioned by the emperor Nero to put down the revolt, soon recaptured many areas in Galilee. By the middle of 69, the deranged Nero was assassinated and Vespasian rushed back to Rome to stake his claim to be the next emperor. He succeeded in his ambition and was crowned emperor that same year. Meanwhile, he handed the command of his military operations in Palestine to his son Titus. In 70, Titus laid siege to rebel-held Jerusalem. It was a long and bloody campaign which finally ended when the Roman forces breached the walls of the ancient city in late summer. What followed was carnage on a scale rarely witnessed in Jewish history. The Temple was looted of all its sacred objects and razed to the ground in a devastating fire started by Roman soldiers who didn’t hear Titus’ command calling for restraint. The complete demolition of the Temple brought down, once and for all, the central pillar of Jewish religious life. Many thought that Judaism as a religion would not survive so grievous a blow. Surprisingly, it did – thanks to the other great pillar of Judaism, constituted by the worship practices of the synagogues functioning all over the empire, wherever there were Jews. 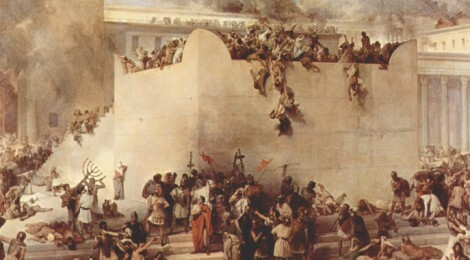 Judaism, post-70, survived primarily because it re-invented itself by replacing Temple-based ritual sacrifices with a worship system based on the public reading of the Torah in the synagogues together with commentary and interpretation by the rabbis and meticulous observances of the Torah’s instructions on everything except rituals connected to the Temple. By shifting the focus from the geographically fixed temple to the eternally portable Torah, Jews readied themselves for their long journey through history as refugees. The Jewish sect that believed in the messianic role of Jesus began to die out in the aftermath of the cataclysm in Jerusalem. Its leader, James, was assassinated during the days of the Jewish revolt and the remnant failed to survive the other traumatic event that befell Palestinian Judaism in AD 136, when, following another failed uprising, the Bar Kokhba revolt, the Romans expelled most Jews from Palestine. Judaism thus ceased to exist in its own homeland and survived purely as the faith of the Jewish Diaspora for the most part of the next two millennia. As for Pauline Christianity, it remained largely unaffected by the events of 70 and eventually became a separate religion based on the divinization of Jesus of Nazareth as elaborated by doctrine of the Trinity, which was evolved by Christian theologians in the Fourth Century AD. Its success was due in large measure to its emphasis on God as a loving and readily forgiving being whose fatherly compassion embraced the repentant sinner. Christianity offered a life of dignity to millions of marginalized people, especially those condemned to a life of servitude and slavery under the Roman Empire. The Jewish Diaspora soon spread across Asia and Europe. For Christianity, the Council of Nicaea, convened by the Roman emperor Constantine in AD 325, proved to be an all-important milestone. At Nicaea, Trinitarian Christianity was declared the orthodoxy, while all other variants of the religion were declared heresies. What began as Pauline Christianity had thus evolved into the official religion of the powerful Roman Empire. Following the collapse of the western half of the empire in the Fifth Century, Europe was converted into the realm of Christendom. In the centuries that followed, Christian hostility towards Judaism increased. Intense pressure was brought to bear on Diaspora Jews living in most Christian lands with the aim of getting them to convert to Christianity. Christianity presented itself as the fulfillment of the aspirations of the Jewish faith and as its continuation and replacement. The refusal of most Jews to accept Jesus as their Messiah and their outright rejection of the Christian claim of the divinity of Jesus incensed Christian religious leaders time after time, resulting in waves of persecution directed at helpless Jews down the ages. Finally, following the near total genocide of European Jewry at the hands of the evil Nazi regime in Germany from 1940 to 1945 (better known as the Holocaust), Christian denominations, both Catholic and Protestant, began the process of reconciliation and dialogue between Christians and Jews. In 2000, Pope John Paul II visited Israel and sought forgiveness for the centuries of misguided Christian hostility towards the Jewish people. Many Jews, understandably, saw it as Christianity’s finest hour. The fallout from the events of AD 70 had thus taken nearly two millennia to settle. Today Judaism itself is pluralistic as there are many different sects within it. Some of them go right back to ancient times while others are of medieval origin and a few have only been around for a couple of centuries. They range from extremely conservative to very liberal. There is even a sect called “Jews for Jesus”, which argues that Jesus is the Messiah that Jews have been waiting for. Orthodox Jews completely reject the claim and call the sect a protestant evangelical missionary group in Jewish disguise. Most modern Jews attempt to blend the more humanistic elements of their traditional faith with the best of modernity. Many are content to be Jews by culture rather than by religious practice. Jews look back on a long history of persecution in the realm of Western Christendom. Over the centuries beginning with the medieval period, all kinds of attempts were made to convert Jews to Christianity. When Jews refused, they were often persecuted. As far as Jews are concerned, the survival of their ancient faith despite centuries of suffering in a Europe dominated by Christianity is nothing short of miraculous. Thankfully, for Jews the rampant anti-Semitism that characterized most European societies and which climaxed in the holocaust, is now largely a thing of the past. But, what really are the sticking points between the two faiths? Well, much of it has to do with the Jewish rejection of the Christian claim that Jesus Christ is God in human form, the same God (Yahweh) that Jews worship. Allied with this is the Christian assertion that the Christian sacred scripture, the New Testament, renamed by Christianity as the Old Testament, is a continuation of the Hebrew Bible. Jews object to this nomenclature because they are sure God made only one covenant (testament) with the Jewish people and clearly declared that it was to be an eternal covenant that would be valid for ever, never to be modified or replaced by another. When Christians point out to certain sections of the Hebrew Bible (notably the 53d chapter of the Book of Isaiah) and argue that these are prophetic references to Jesus, the “suffering Messiah”, Jews are quick to declare that those sections are misinterpreted by Christians. In the case of Isaiah 53, for example, they point out that the preceding chapters clearly establish the fact that the figure of the “suffering servant” is the nation of Israel personified and not some sort of prophetic code for Jesus. Besides, there are clear differences, say Jewish rabbis, between the Jewish teachings about the Messiah, (who will one day be born among the Jewish people and bring about God’s universal justice for the world) and the Christian attribution of the title to Jesus. According to Judaism, the Messiah is not destined to suffer but to triumph. All those passages that Christians claim to be about Jesus as Messiah, such as Isaiah 53, are, according to Judaism, clearly not messianic but about Israel as God’s suffering servant, as made clear in the previous chapters. And when it comes to the question of the Messiah also being God in human form, Jews strongly disagree. They point out that there is not a single verse anywhere in the Hebrew Bible (the ‘Old’ Testament to Christians) that makes such an assertion. Judaism declares that the doctrine of ‘incarnation’, God taking on human flesh, is completely alien to Judaism. According to the rabbis it is an entirely pagan concept and Jews should have nothing to do with it. Jews have, by and large, no problem with pluralism and respect for the rights of people to follow their own religion. Devout Jews only demand that they be allowed to practice their own faith without interference from governments or other religions. Most of them are quick to recognize the positive elements of other faiths including Christianity and willingly enter into any process of inter-religious dialogue that is based on joyful affirmation of common elements between faiths and on respect for the right to differ. Jewish interest in inter-faith dialogue has been active since the middle ages. The 12th century Jewish teacher Moses Maimonides taught that Jews should honour all Gentiles (non-Jews) who live ethical lives. All gentiles who follow the Seven laws of Noah (sourced from the Talmud) are to be considered “righteous gentiles” according to Judaism. These “Noahide” laws are simply broad ethical principles devoid of specific religious injunctions. Thus Judaism has never felt the need to proselytize people of other faiths as it believes that God honours all non-Jews who are ethical in all the departments of life. Neither does the Jewish faith present perfection as the absolute requirement to please God. It emphasizes the fact that God honours true repentance and readily forgives those who admit their mistakes, ask for mercy and make a commitment to turn away from the ways of injustice and evil. According to Judaism, God does not need anyone to die as a sacrifice for the sins of humanity, in order for him to release forgiveness. Long before Jesus Christ, the Hebrew Bible clearly declared that God would amply forgive the penitent sinner and the one who came to him with a contrite heart. The Hebrew Bible sums up all this in the words spoken by the prophet Micah: “He has showed you, O man, what is good. And what does the Lord require of you but to act justly, and to love mercy and to walk humbly with your God.” (Micah 6:8) As far as Jewish – Christian dialogue is concerned, what can be more emblematic of its spirit than the famous words of the Jewish philosopher Martin Buber: “I do not believe in Jesus; I believe with him”!